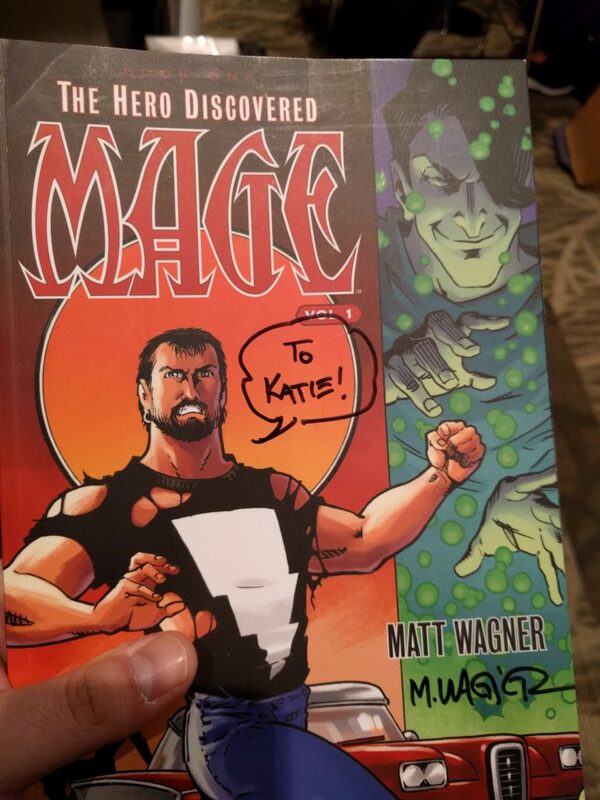 Ian got my favorite comic book writer/artist to sign one of my comic books while he enjoys four days of Emerald City Comic Con. A surprising Thursday – We thought Benji would spend the night at my parents’ house, but my mom came down with a sinus infection, so he came home instead. Mere words cannot express the depth of his sorrow. An easy Friday – Ian actually arrived home on a bus that dropped off near Benji’s school, just as school was getting out. Then, about 6:00, my dad and, a little later, Teresa arrived for pasta dinner. Nice! A fun but exhausting Saturday – After substantial initial resistance, Benji conceded to my plan to spend the morning taking a ferry to Kingston and back. This turned out delightful, if wet and sandy. We have an afternoon hiking date with my friend Ellen, and I think I’m going to have to wake Benji up from his nap to keep the date. That means it was a successful morning! I’m planning to sneak out on my newly repaired S-Works for a solo ride tomorrow while grandparents take Benji. After all this, I’m going to need a whole nother weekend to recover!